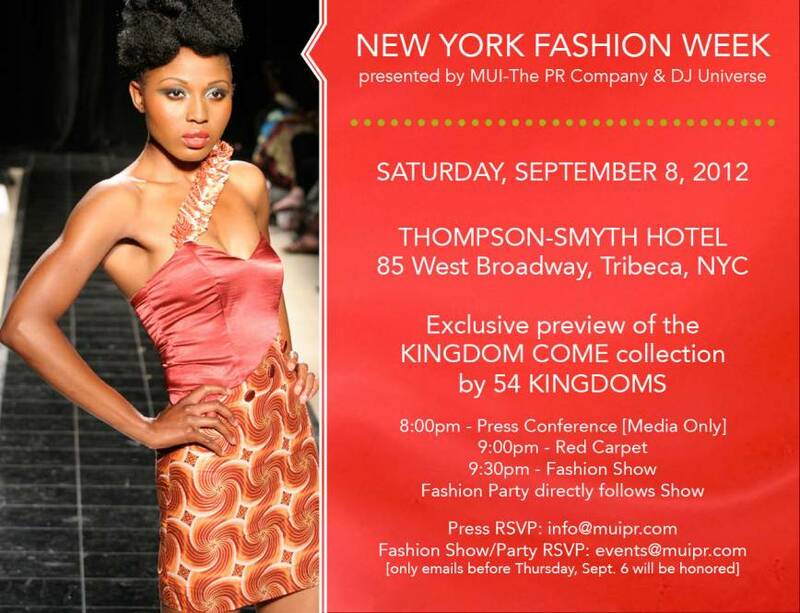 NEW YORK, NY—On Saturday September 8th, MUI-The PR Company (MUIPR) and its leading entertainment client, DJ Universe, will produce a fashion show and after-party during New York Fashion Week (NYFW) for the Kingdom Come collection from Pan-African fashion house, 54 Kingdoms. The fashion event, featuring glamorous lifestyle creations for the quintessential man and woman, is scheduled to be unveiled at the elegant and globally-recognized Thompson-Smyth Hotel, located on 85 West Broadway, Tribeca, NY. The event will start with a press conference at 8PM, providing members of the press with a unique opportunity to learn more about the history, vision and aesthetic of the Kingdom Come 2012 collection. From 9PM to 9:30PM, guests will enjoy photo opportunities and interviews on the red carpet hosted by African socialite, Ms. Mazuba Kapambwe. Immediately following the red carpet interviews will be a presentation of the Kingdom Come 2012 collection and a fashion after-party with dance music by Afro-Electronic Dance Music creator, DJ Universe. “With the tag line ‘Bold Colors for Bold People’ the designers at 54 Kingdoms, Mr. Nana Poku and Mr. Kwaku Awauh, capitalize on their love for Africa , to present a showcase that is stylish, smart, and with the same bold wonder as the designers who created them,” said Genevieve Mbamalu, publicist at MUIPR. She further added, “Using a color palette characteristic of their love for bold colors, the collection presents fashion rich in substance, sophistication and creativity”. Access to the NYFW show and after-party is by RSVP only. Press RSVP: info@muipr.com and Fashion show/after-party RSVP: events@muipr.com. About MUI-The Public Relations Company: MUIPR is a newly-formed public relations and promotions company in NYC specializing in a diversity of accounts for African businesses and leaders in the non-profit, entertainment, politics, lifestyle, urban development, and health care industries. Connect with MUIPR today to learn more: www.muipr.com |www.twitter.com/muipr |www.facebook.com/muipr |www.pintrest.com/muipr. About DJ Universe: DJ Universe is the world’s most expensive DJ and creator of the new wave of dance music entitled Afro-Electronic Dance Music (A-EDM). Connect and socialize with DJ Universe: www.twitter.com/greatdjuniverse |www.facebook.com/ldjuniverse | http://soundcloud.com/dj-universe-l-a-nidas.